Shoegazing (also known as shoegaze) is a subgenre of alternative rock that emerged from the United Kingdom in the late 1980s. It lasted until the mid 1990s with a critical zenith reached in 1990 and 1991. I was on the toilet reading Rolling Stone. When you write about music on a regular basis, you need to have multiple sources of influence and I try to keep a balance. I usually sit on the toilet, read all the new music reviews, and pick one, and only one of these bands Rolling Stone thinks I should be listening to, to check out. In my opinion it was an easy choice out of all the crap stuff mentioned this month. Even still, after reading this particular review, I was not sure what to expect. Concept album about the civil war? Weird. Bruce Springsteen? Huh. Raging guitars and spit-spraying punk noise? Yes! Ah...yes... Titus Andronicus. Enter. huh? An early play by Shakespeare? (bloody one apparently) Who IS THIS band? I check out the band's MySpace page. Ok...a music video...that's a good start. The band had a few songs in their MySpace player, and I was feeling all of them. So I went for it, and bought the album The Monitor (the name taken from the USS Monitor which did battle with the CSS Virginia on March 9th, 1862. Guess what the release date for this album was? That's right...3.9.2010). I loaded it on the iPhone and headed out into the world to listen to the album. I couldn't believe how good it was. Later I FaceBooked that it might be the best punk album of 2010 (at least until the new Bad Religion album comes out.) I was pretty floored when I looked up Titus Andronicus on Wiki and discovered that there was a genre called Shoegaze, and that, along with Punk, was one of the genres used to describe this band. Um...really? Listen to this song and just imagine the band just staring at the floor. The shoegazing sound is typified by significant use of guitar effects, and indistinguishable vocal melodies that blended into the creative noise of the guitars. The term was picked up by the NME, who used it as a reference to the tendency of the bands' guitarists to stare at their feet—or their effects pedals; seemingly deep in concentration, while playing. Not that song, but after a few more rotations through the album, I guess I could identify a few songs that we could classify as shoegaze...but man....although I get it, what a crazy idea for a genre. Although I barely passed United States History, a concept album about the civil war is definitely something new...and I dig the whole vibe from beginning to end. I mean, concept be what it may, the themes are still angst and loneliness. The lead singer and song writer, Patrick Stickles, is able to weave these ideas together so well. It's hard to know whether you are on the front lines of the war or back in the present day dealing with what it's like to be bullied and bothered by the same psychopaths that fucked with us in high school. One of my favorite lines from the album comes from a great song called "A Pot In Which To Piss" and the lyric goes like this: "You ain't never been no virgin, kid, you were fucked from the start. It's an album that uses a lot of "F" words. Yes...that one, but what you need to hear are the other F words. Fear and frustration. Fear and frustration we all have, that we can all relate to. It's bad. It's damned bad. The economy, the world. Fears we can overcome... if only the album had bagpipes! Oh! It does! The war is over! After listening to the album countless times, you catch interesting things, like a Scooby Doo reference (“You may have gotten away with them too, if not for those meddling kids.”) or particularly fitting as I am writing this on Easter is the line "Come in on a donkey" which is a reference to Palm Sunday. It's got a lot of personal stuff to the band. Many mentions of New Jersey (where the band is from) and references to books, plays, and songs important to Stickles. I really enjoyed cross referencing all the different connections in the lyrics. From beginning to end, it's a great record. Rolling Stone are assholes for only giving it 3.5 stars. It's a five star record. Without question. 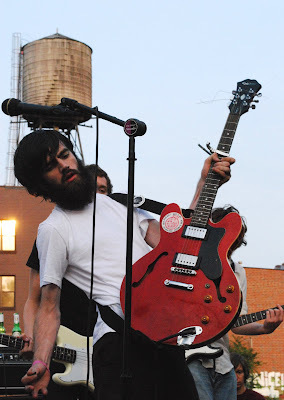 Check out the Titus Andronicus website, and buy the album. You don't need anymore regrets do you?